Below are publications on low frequency electromagnetic fields. Havas, M., S. Shum, and R. Dhalla. 2004. 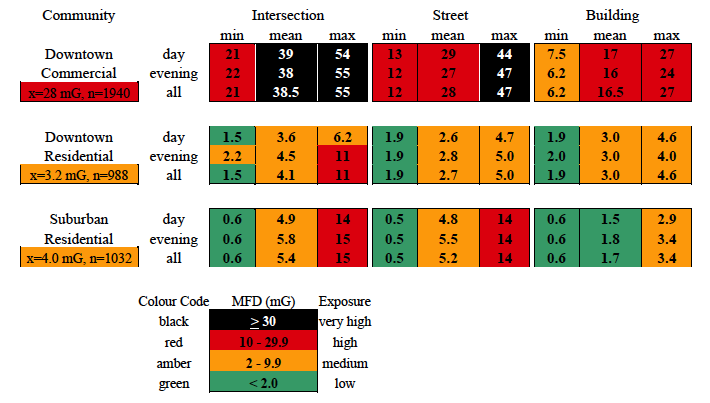 Passenger exposure to magnetic fields on go-trains and on buses, streetcars, and subways run by the Toronto Transit Commission, Toronto, Canada. Biological Effects of EMFs, 3rd International Workshop, Kos, Greece, 4-8 October, 2004, pp.1065-1071. Click here for pdf. Havas, M and J. Mackay. 2004. Street level magnetic fields within the City of Kingston, Ontario, Canada. Biological Effects of EMFs, 3rdInternational Workshop, Kos, Greece, 4-8 October, 2004, pp. 318-325. Click here for pdf. Havas, M. 2004. Biological Effects of Low Frequency Electric and Magnetic Fields. Derek Clements-Croome (Ed.). 2002. Electromagnetism and Health, Taylor & Francis Books, Ltd., London, England. 25 pp. Click here for pdf. Havas, M. 2002. Intensity of Electric and Magnetic Fields from Power Lines within the Business District of Sixty Ontario Communities. Science of the Total Environment 298:183-206. Havas, M. and D. Hanna. 2000.Magnetic Fields in Peterborough Schools: the findings and strategies to reduce exposure. Presented to the Peterborough-Kawartha-Pine Ridge School Board, Health and Safety Committee, October 2000. Havas, M. 2000.Biological effects of non-ionizing electromagnetic energy: A critical review of the reports by the US National Research Council and the US National Institute of Environmental Health Sciences as they relate to the broad realm of EMF bioeffects. Environmental Reviews 8:173-253. Click here for 80 page pdf.